Those are also the only two options available for the boot order. Can anyone help me understand what these boot order options represent? Are things already the way they're supposed to be, prior to my Ubuntu installation attempt? Advice Regarding the 'Allocate Drive Space' dialog box of the Installer- which option to select? The first option sounds the most automated (so I have a smaller chance of accidentally changing something I shouldn't), while the second option is clearly labelled advanced. My question is: will the first option allow me to properly select the E drive for installing Ubuntu, or will it try to automatically install it in C? Another concern: as per this webpage (http://news.softpedia.com/news/Installing-Ubuntu-12-04-LTS-266201.shtml), choosing option 1 will result in "Remember that, after the installation, the Windows boot loader will be overwritten by the Ubuntu boot loader!" This sounds rather ominous- is it liable to cause problems for running Windows? Basically, which option would be best suited for my target installation situation? The boot options in your BIOS specifies the order in which your computer checks for the first program to be run (be it a bootloader, operating system, or installer). The way your BIOS is set up looks fine already. Typically, you start your computer up with nothing in the CD drive. In that case, your BIOS will find nothing in the CDROM and then proceed to check the hard drive, where it finds windows 7 and boots. 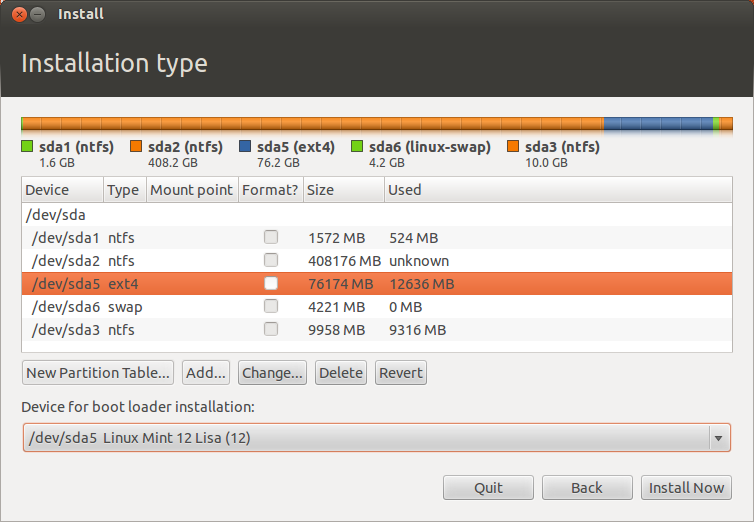 As for the partitioning options, the option to install alongside other OSes looks the least-likely to do harm. However, I do not think the installer will be intelligent enough to use the "E" partition automatically. It should be fine to go to the advanced options and manually specify to install on the E partition. I would recommend reading a tutorial or guide on how the advanced section in the installer here works though. What you DON'T want to do is format your Windows or Media partitions. Also, having the Grub bootloader (which is what the Ubuntu installer will install) will typically not mess up booting into your Windows 7 partition. It's pretty good about these things, and will automatically detect that partition and allow you to select it when you turn on the computer. Still, if anything does happen where you cannot boot into Windows 7, you can boot from the Windows 7 DVD installer and click "repair my computer" which will reinstall the Windows 7 bootloader (at which point you'd have to use something like EasyBCD to tell the Windows 7 bootloader about your Ubuntu install, as it's not as intelligent). Not the answer you're looking for? Browse other questions tagged boot-order or ask your own question. How can I repair my Boot Manager?